A hint of autumnal Beatlemania was in the air on Sunday as Paul McCartney, for the second time in his improbable life, climbed the steps of venerable Old Marylebone Town Hall to take himself a bride. True, thousands of heartbroken female fans crowded the columned building in 1969 when he married Linda Eastman, and only a few hundred showed up on Sunday as he wed another American, Nancy Shevell, at the very same registry office. The affection -- and rose petals and confetti -- showered on McCartney and his bride captured his particular place in British life. Today Sir Paul -- or Macca, as he's usually known -- is celebrated as a musical legend who is still composing and releasing CDs, even if they no longer routinely shoot to No. 1 on the charts. His forays into opera, ballet, painting and poetry have not been critical successes, but none of these have tarnished his reputation. McCartney is credited for having survived a number of tragedies -- the 1980 murder of one-time songwriting partner Lennon, the loss of his beloved first wife Linda, the 2001 death of guitarist George Harrison and the public breakdown of his marriage to Mills -- with his upbeat nature intact. Mills, a much younger model who had lost part of her leg when she was hit by a motorcycle, tried to battle McCartney in the court of public opinion during their divorce. She accused him of cruelty and sought a gargantuan $250 million settlement. But her charges against McCartney didn't stick. Few if any fans turned against him, and the divorce court judge ruled against her, calling her demands exorbitant and unfair. The very public spat opened McCartney's vast fortune to unprecedented public scrutiny. Long rumored to be pop's first billionaire, he was found to have assets worth about $800 million, including works by Picasso and Renoir and luxury real estate in the United States, Britain and elsewhere. His wealth reflects in part his incredible global popularity -- in recent years he has filled stadiums from Rio to Russia, producing tens of millions of dollar of revenue with each tour. 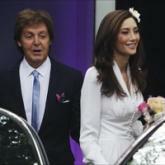 She has a few things in common with Eastman: like McCartney's first wife, she is American and affluent. Unlike Eastman, who performed with McCartney's post-Beatles band Wings, Shevell is not expected to join her husband onstage on his extended world tours. She joins a pantheon of "Beatle wives" -- each band member married more than once, and many of the unions were troubled. Lennon abruptly left his first wife for Yoko Ono, and Cynthia Lennon has complained in print about his abusive treatment of her and his neglect of their son, Julian. His relationship with Ono was punctuated with occasional breakups, but is often portrayed as a happy marriage, and since his death she has curated his works and burnished his legend. Starr's first marriage also ended in divorce, but he has had a long, stable union with his second wife, the actress Barbara Bach, who joined him at Sunday's ceremony. The two even went through a recovery program together when Starr decided to confront his alcoholism. Harrison's first marriage -- to the model Pattie Boyd -- ended in divorce when she left him for guitarist Eric Clapton. He had a long happy marriage to Olivia Harrison, who plays an important role in the recently released Martin Scorsese film about Harrison. If the mood Sunday is any indication, the man responsible for classics like "Penny Lane" and the angst-ridden "Eleanor Rigby" may find pleasure and contentment in the years ahead. That's certainly what his fans are hoping.